Australia’s squad to play two Test matches against Sri Lanka is set to be named this afternoon, but if reports are to be believed, Victorian youngster Will Pucovski is in line for a shock call-up. Fairfax Media’s Chris Barrett and Andrew Wu are reporting Pucovski will be named in the squad, while all three of Aaron Finch and Mitchell and Shaun Marsh will be dropped. Pucovski has only played the one Sheffield Shield game after taking some time away from the game to deal with mental health issues, however, the 20-year-old is rated as one of the brightest young prospects in the Australian game. 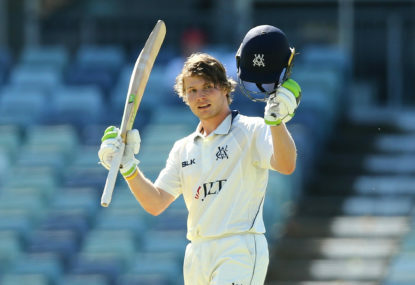 Since making his Sheffield Shield debut in February 2017 when he was just 17 (he turned 18 on Day 2 of the game), Pucovski has averaged almost 50 across his eight first-class games, but it’s this season the Victorian has really made a name for himself. He racked up 243 runs at the WACA against Victoria in his last game before taking time off, then returned with a solid 67 against Western Australia in December. Before his breakout performance this summer, he scored 188 against Queensland at the Melbourne Cricket Ground in 2017-18 and also had a double-century in the Futures League just before that. The selectors blooding the 20-year-old is a risk, but it’s one they may be willing to take after Australia were handed their first ever home series defeat to India, one in which the hosts were flattered by the 2-1 scoreline. The upcoming matches against Sri Lanka are Australia’s last two Tests before the Ashes in England later this year. The batting efforts in that series were poor, with no centuries scored and Australia forced to follow on at home for the first time in 30 years during the fourth Test at the SCG. In addition to Pucovski, reports are circulating that Queenslanders Matt Renshaw and Joe Burns will both earn Test recalls later this afternoon, while Peter Handscomb is in danger of being dropped for the second time in three matches. The squad for the two Tests against Sri Lanka, to be played at the Gabba and Canberra’s Manuka Oval, will be announced at 3:30pm today.